When I first got into CS 1030, I did not expect anything new that would be an eye opener to technology. I thought that over all the years that I have been using computer and other electronics, there was not much that this class could teach me. I was sorely mistaken, in the next few weeks that followed. I soon discovered that there was more I didn’t know than I have ever imagine .I soon found humility and humble at the thought of so much that I was learned from the class. One of the things that I have taken away from this course, which will always be on my mind, was our talk on the impact of technology. When Professor Pope talked technology and its biological impact, the course really hit home. I think we take everything around us for granted, and not knowing the true cost of what these technology cost. It was very shocking during a lecture, when the professor asked the classroom in a scenario,” if there was a person who would interrupt the power supply to a community because it was killing him, would you rather not have power, to save the man.” The class response was that it was tolerable only for a certain amount of time. The man would have to die in order for the rest of us to get power. 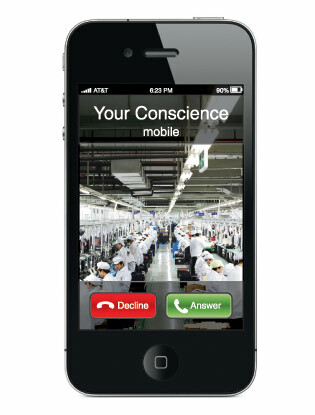 The class quick utilitarian response, made me realized for the time that there is an ethical need in technology. We used and throw away technology without ever considering the impact it has on our lives and the environment. 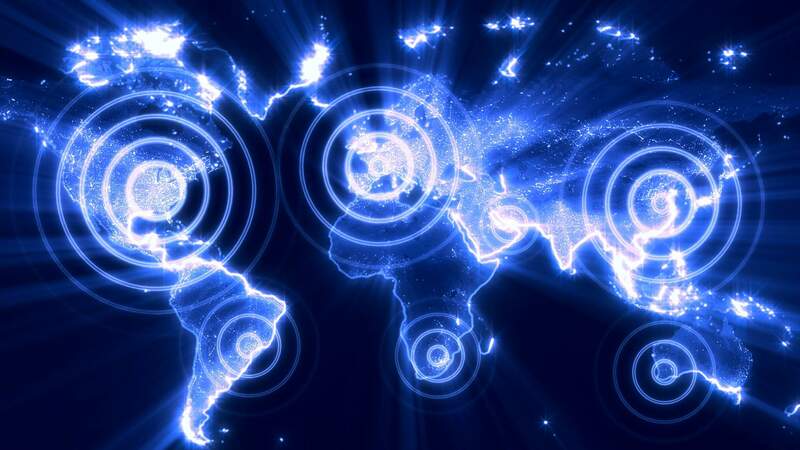 There is more technology today than ever before, every year manufacturer make 100 million computers and over 1 billion cell phones. This high number is expected to grow by 8%, but with this, there comes a great cost to humanity. The real cost of ownership consist of building the technology and disposing of it. These two factors play a huge role in what we do to the planet and ourselves in the process.” What is the true cost?” professor pope asked, this question made me ponder what it took for me to type on this laptop. I realized now that it cost a lot more than the 600 dollars I paid. First I thought about how technology has gotten cheaper over the years, and better more advance than ever before. I remember my first computer costing 3,000 dollar with a Pentium 2, and 11 gigs, compared to my laptop costing only 1/5 running an i5 with 500 gigabyte. The cost of technology declining has greatly to do with the outsourcing of jobs, and exploitation of people. The manufacturing jobs that were here in the United States are now outsourced over sea, the majority of these outsource goes to China. 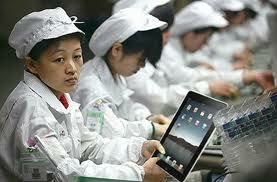 The good paying jobs with benefits in the USA are now replaced by prison like sweat shop manufacturing in China. The Chinese workers don’t get any of the benefits or pay that their U.S. counterpart have, they often work more than 80 hours a week ,12 hours a day and discipline with draconian rules. The workers of Meitai factory in China, make about 41 cents a day assembling keyboards, they work 12 hours a day and live in factory dormitories. The living condition is horrendous for these workers; they share a tiny studio room with more than 5 people. The only personal time they get is two days off a month, and if they used it on a Sunday they are disciplined with docked paid equal to 2 ½ day pay. They are often cheated out of there pay by a whopping 19%. The workers are taught to treat the factory as home, and that their personal honor and prosperity are connected to the factory. A company by the name of Foxconn in china made the world aware of these exploitation when it’s workers committed suicide by jumping off the roof of buildings. The workers family would receive compensation if the workers died. The compensation was only 3,000 us dollars, and after 17 deaths, Foxconn removed the policy for compensation. The compensation to us is a small amount but to these workers being exploited, it would mean years of work before they would ever have that kind of money. Foxconn is a big manufacture of electronic goods, it accounts for 40% of all the electronic technology sold in the world. The company is known for making Sony, Nokia and Apples electronic, I’m sure we have used some kind of electronic that came from Foxconn. Second I thought after I’m done with the laptop, where does it go next? I’m sure a part of this is recycled, but not all. So what happens to my E-waste? Apparently it goes back to the country that first made it. The majority of the E-waste is ship and sold to countries like Nigeria and China. The disposal of hazardous is too expensive to recyclers here in the U.S. and Europe , so they just ship the waste to these third world countries .These countries, take the E-waste and scavenge the electronic for parts and other component of any value. The problem is these workers get expose to the hazardous material inside these electronics. They are exposed to mercury, BFRs, lead solder, Americium, Cadmium and other hazardous material within the parts. The E-waste is then burned or disposed of in dumps, leading to water contamination and air pollution. The pollution and toxic material contaminated the environment leading to high level of toxicity to the population. E-waste also produces a new wave of cyber-crime, identity theft. The computer hard drive that contain confidential data, pictures, phone numbers and other personal information ends up in the hands of scammer and con artist. The data can quickly be used to steal money, create false documentation, or sold to collectors. Company, individual and government entities often dispose of their computers and other electronics without properly erasing the hard drive. 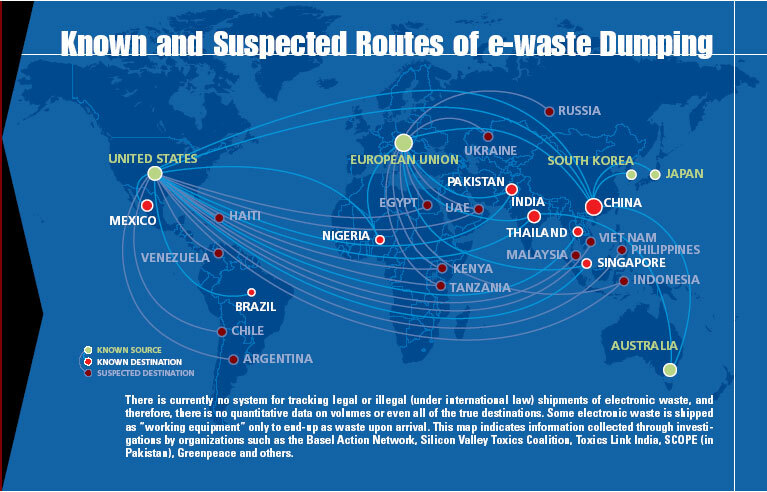 There is a close connection between identity theft and export of e-waste. The majority of most cyber-crime comes from Africa, it no coincidence that Africa is a major destination of E-waste. Technology is all around us, it comes to us at a price, and sometimes that price isn’t just monetary. The price we are willing to pay for it might be too high, if it means that human rights are violated, people dying and the destruction of our planet. We can change this, by demanding accountability from the manufacturer and from ourselves. When we are done with our technology, we can dispose of it properly with a recyclers who is certified E-stewards, this certificate means that the recyclers will not incinerate the e-waste, dump it in landfills, or export it to poor countries to deal with. We can keep technology from becoming e-waste by keeping our electronic for a longer time span, meaning not buying the latest and greatest. We can curb e-waste by buying used electronic that might just be old just a few months, by creating a demand for these used electronic; we can keep it from becoming e-waste. The most important step is educating people about technology awareness; people can’t change if they don’t think differently. Basel Action Network and Silicon Valley Toxics Coalition (2002-02-25). “Exporting Harm: The High-Tech Trashing of Asia”. Carroll (January 2008). “High-Tech Trash”. National Geographic Magazine Online.